Brief Synopsis – A detective is hired to find out who murdered a prominent cheese scientist who was on the verve of an astounding discovery. My Take on it – This film utilizes a very interesting plot device that unfortunately doesn’t work as well as one would hope it would. The idea to have the characters interact with characters from old Noir movies is quite clever but the inattentiveness of it all wears off quite quickly. 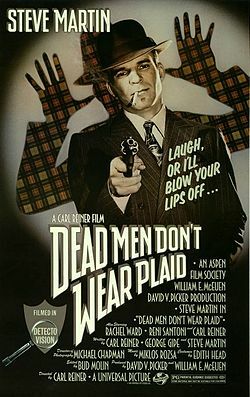 Steve Martin was an interesting choice for the lead but he is much better at roles that involve a bit of humor or sarcasm even when playing a somewhat dramatic role. Personally, I think that the concept utilized here works much better on a smaller scale and in order to see a great example of that, you should check out what Billy Crystal did at the Oscars. Bottom Line – Great idea that just doesn’t work as well as one would hope. The concept of integrating famous characters from noir movies into this films plot is a great one, but it loses it’s effect quite quickly. Martin is ok as the lead but seems a bit miscast as a straight laced Private Detective. I personally prefer shorter uses of this whole concept similar to what Billy Crystal was able to achieve at the Oscar Ceremonies over the years. Genre Grandeur Worthy? – Not really. Clever idea, but it just doesn’t work as well as when Billy Crystal did it at the Oscars.